Oil prices, for both international Brent and U.S. WTI crude, rose at least 7.9 percent on the day after slumping more than 6 percent on Christmas Eve. Some traders say the price slide, prompted by worries over the global economy, had been overdone. A floorhand operates a Chevron oil drilling rig near Taft, California. 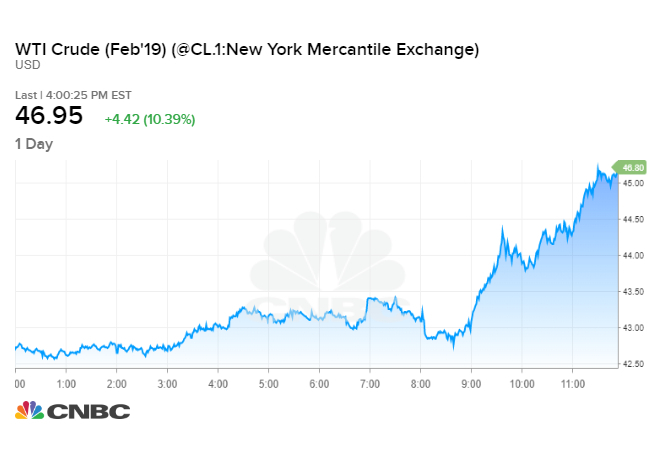 Oil surged on Wednesday, posting its strongest daily gain in more than two years in a partial rebound from steep losses that pushed crude benchmarks to lows not seen since 2017. Both U.S. and Brent crude rose about 8 percent, their largest one-day increase since Nov. 30, 2016, when OPEC signed a landmark agreement to cut production. It was unclear whether follow-through buying would push prices higher again once trading desks are more fully staffed after the new year begins. The bounce on Wednesday amounted to a relief rally after Monday's plunge, with the energy complex getting a boost from the surging equity market, said John Kilduff, founding partner at energy hedge fund Again Capital. The Dow Jones Industrial Average rose more than 1,000 points, posting its biggest-ever one-day point gain on the heels of the worst Christmas Eve on record. "There was all the tumult across the market like it was the end of the world," Kilduff said. "The sun came up today." U.S. West Texas Intermediate crude futures ended Wednesday's session up $3.69, or 8.7 percent, at $46.22, rebounding from a 6.7 percent plunge on Monday. WTI traded more than 10 percent higher near $47 a barrel after the settle. Brent crude oil futures, the global benchmark, rose $4, or 7.9 percent, to $54.47. It earlier fell to $49.93, the lowest since July 2017, and posted a 6.2-percent slide in the previous session. Brent also extended gains after the settle to trade more than 9 percent higher above $55 a barrel. Crude has been caught up in wider market weakness as the U.S. government shutdown, higher U.S. interest rates and the U.S.-China trade dispute unnerved investors and exacerbated worries over global growth. "The market is still really concerned about demand," said Bernadette Johnson, vice president in market intelligence at DrillingInfo in Denver. The sell-off "doesn't signal strength of confidence in demand, but we still went too far too quick. We still believe $45 is too low." Recent selling "has felt less fundamentally driven and more a function of the overall market meltdown as increased equity volatility and growing macro concerns have weighed on a number of asset classes," wrote analysts at Tudor, Pickering & Holt. Funds have incurred heavy losses in oil markets this year, with the average commodity trading adviser fund, or CTA, down by 7.1 percent on the year through mid-December, according to Credit Suisse data. Funds took big bets on oil's rally, only to see the commodity drop by more than 40 percent since the October highs. The head of Russian oil company Rosneft, Igor Sechin, predicted an oil price of $50-$53 in 2019, a long way south of the four-year high of $86 for Brent crude reached earlier this year. Still, oil's outlook is not as weak as in 2016 when a supply glut built up, because OPEC this time is trying to prop up the market, said Olivier Jakob, analyst at Petromatrix. OPEC and its allies including Russia decided earlier this month to cut production in 2019, unwinding a June decision to pump more oil. The combined group plans to lower output by 1.2 million bpd next year. OPEC's share is 800,000 bpd, next year, and some ministers have even suggested taking further action.